This set of cards is a perfect addition to a unit on WWII. Each card has a picture to help students (ELL, Sped). 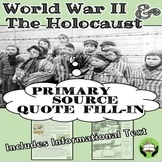 Combine student analysis of primary source pictures with reading of secondary source informational text to introduce students to World War two and The Holocaust time period. GREAT PAIRED WITH A NOVEL! 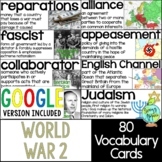 This is an interactive way to allow students to explore history.Includes:-Common Core Alignment-"
This file contains vocabulary handout of words from the Georgia Social Studies Standard SS5H6. The file also contains homework and a quiz. This is a World War 2 Vocabulary assignment. Students are given 10 vocabulary words and they have to write the word, the definition, use the word in a sentence and draw a picture. This can work for upper elementary all the way to high school. 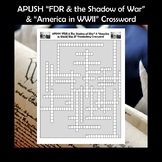 This student handout includes the essential vocabulary for the US History II World War II Unit. The back of the page includes a graphic organizer / activity based on LINCing tables. The presentation answer key reveals the answers individually as you move through the presentation. 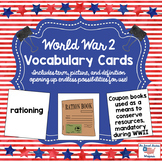 Key vocabulary words for students on Access Points to understand WWII. Students can copy, or cut/paste vocabulary words for the unit. Then students can evaluate which picture best matches the definition. This product allows students to match vocabulary words with their proper definition. There are 9 words like Holocaust, Adolf Hitler, Blitz, appeasement, etc. Quick do now or homework. Important terms for students to learn before learning about WWII.